My “supply area” is in a portion of our basement. I stamp there, at the kitchen table, at friends’ homes, on our patio. 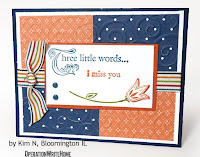 I’m a very mobile stamper – tee hee! If I had to name one I would pick almost anything byStampin Up; but I purchase products from many manufacturers to get the variety I want. My colored pencils and blenders pens are probably my favorite products. 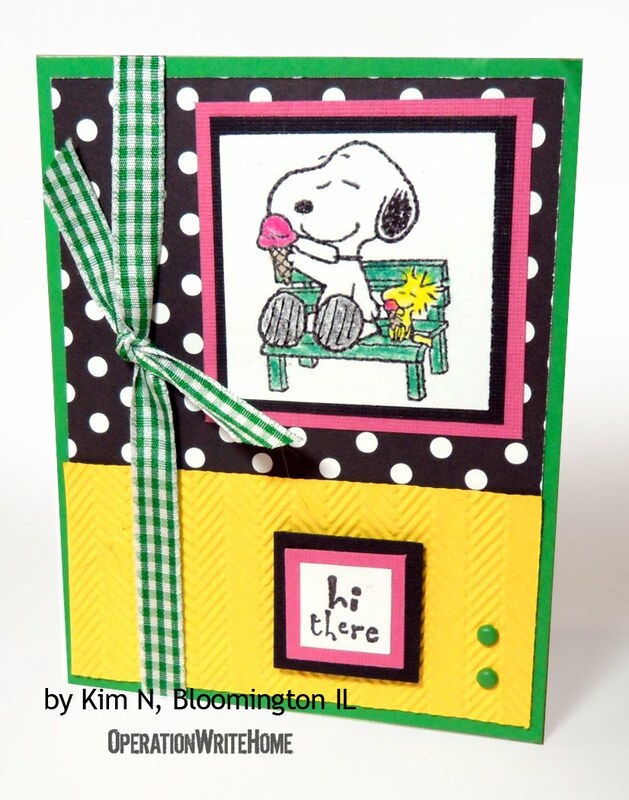 Coloring and embossing – I can’t pick just one! My personal favorites are purples, greens, corals. I use a variety of colors when I make cards for OWH to try to appeal to as any peoples’ taste as possible. 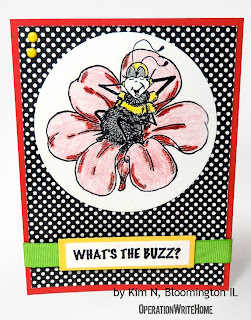 I was on the SplitCoast Stampers website and saw someone had been making and sending cards for what was then “Cards for Heroes”. I was very interested and signed up immediately for the reasons listed below. Every single day there are men and women putting their very lives on the line to protect my, my families, friends and our country’s freedoms. They also put their lives on the line for so many people in other countries. That’s just almost unfathomable to me. I feel a very strong need to give back to these brave men and women. On a personal level, my Grandpa, (one of my favorite people ever) served in WWII (long before I was born). I make cards for our heroes in his memory. Also, during the years of the Vietnam War (I was a teenager) and my high school teacher introduced us to the P.O.W. bracelet program. I wore a bracelet in honor of a Lieutenant in the U.S. Marines who was a P.O.W. in Vietnam. I heard from his parents (who I corresponded with) about 3 years after I started wearing the bracelet that he had escaped and subsequently died after he was back in the U.S. in a hospital being treated for the horrendous injuries he had suffered while in captivity. I make cards in honor of his memory and his family. 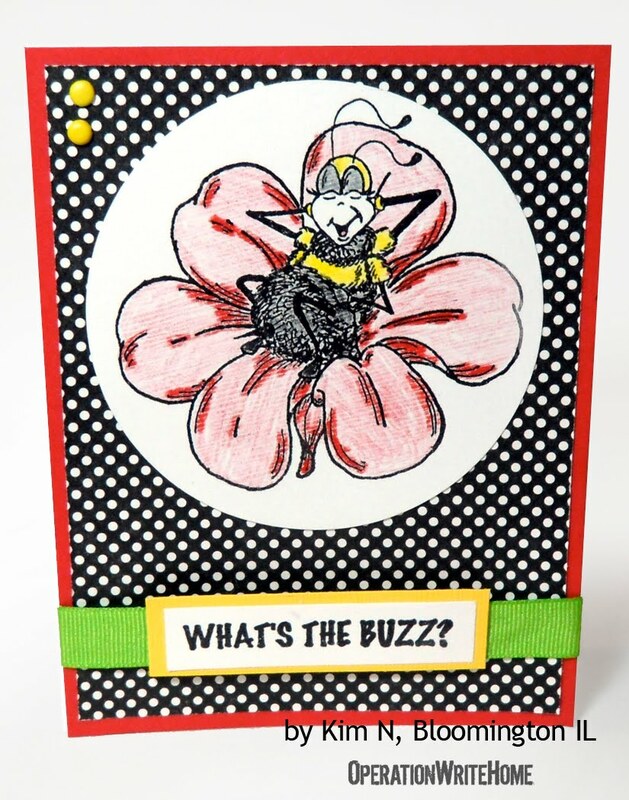 If you want to get really simple about it – I make cards for our heroes because it makes me feel good! Nice to meet you and learn a little bit about you Kim! Your cards are unique and so pretty! I love your reasons for joining OWH, what an inspirational story!! 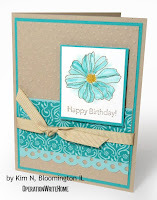 These cards are just beautiful Kim. Love your artistic coloring style. 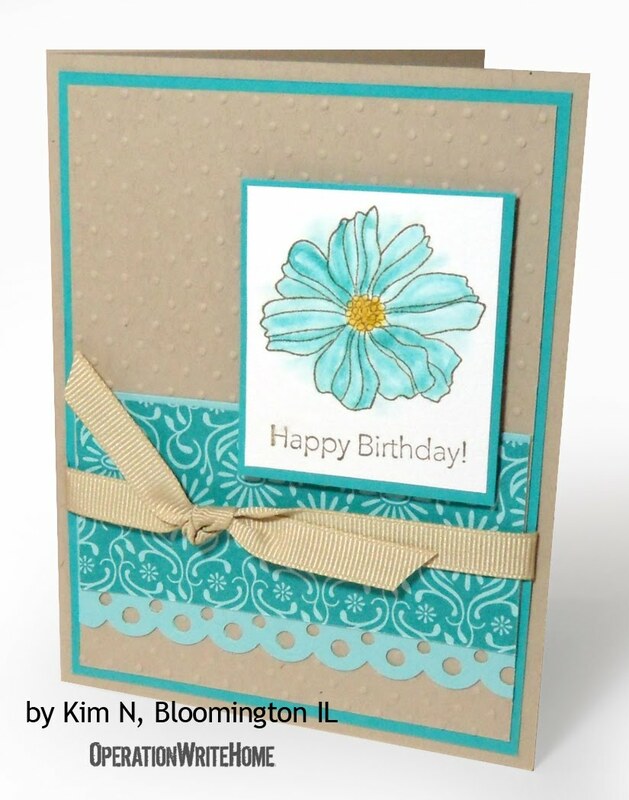 The turquoise and tan birthday card is my favorite. 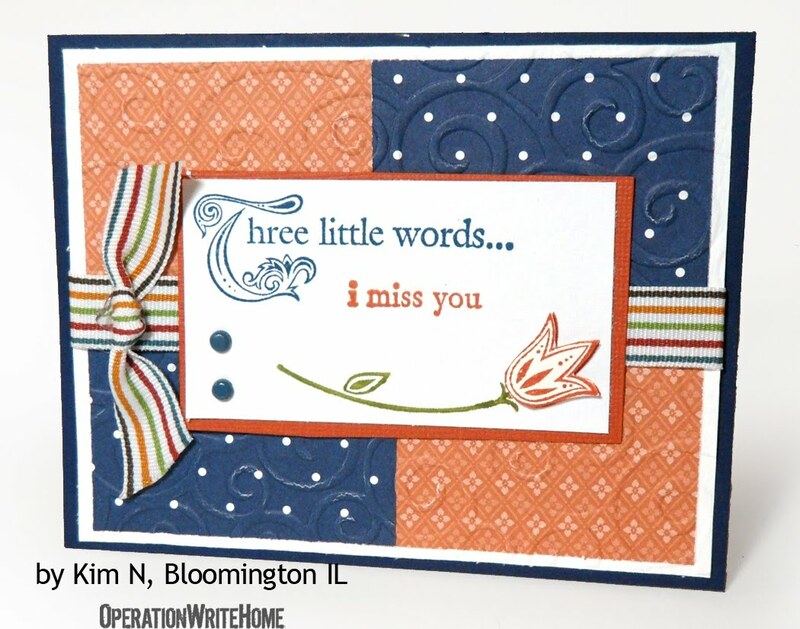 Perhaps the best part of all you've shared is the very personal things that motivate you to make cards for OWH. Thanks for keeping the rest of us motivated too! I love that tan and aqua card. 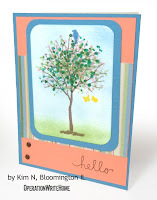 Kim, your cards are lovely! Thank you for your dedication to our heroes and OWH. I enjoyed reading about your motivation. 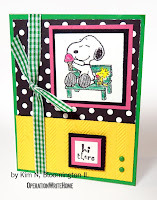 Beatiful cards, Kim. 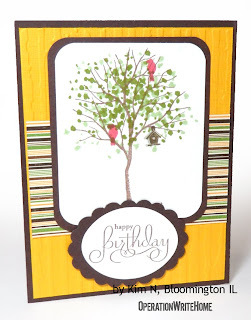 And your reasons for making cards are very inspiring. Thanks for sharing. 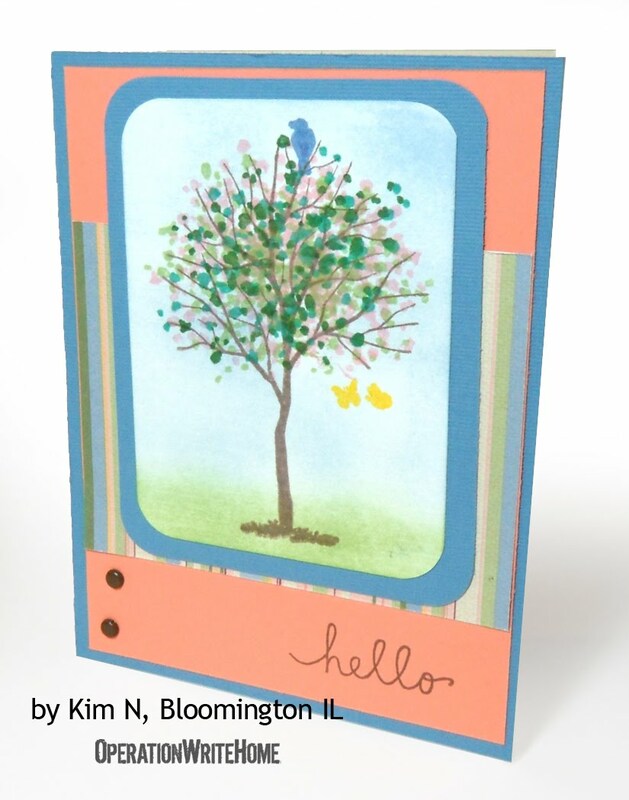 Kim its a pleasure to meet you and see your wonderful cards. OWH is such a great organization and I'm proud to be a member as I can tell you are too! Kim, do you have a link to a blog we can follow?